The shares are being transferred in a bid to avoid any potential conflict ahead of next month’s Budget. Minister for Finance and Public Expenditure and Reform, Paschal Donohoe. MINISTER FOR FINANCE Paschal Donohoe has begun the process of transferring all shares he holds in Diageo to his wife in a bid to avoid any potential conflict ahead of next month’s Budget. In July, the minister was asked if he plans to sell his shares in Diageo because he now has control over excise in October’s Budget. In 2015, The Irish Times reported that Donohoe, who was then the Minister for Sport, had absented himself from all decisions relating to a Bill dealing with the issue of alcohol sponsorship of sports because he holds shares in the drinks company. In light of his new ministerial position, questions were asked about whether there is now a conflict of interest with his shares. “There’s nothing that I have ever done in my career that I have been privileged to have, as a public representative and a Cabinet minister, that has focused on what my private interests are. 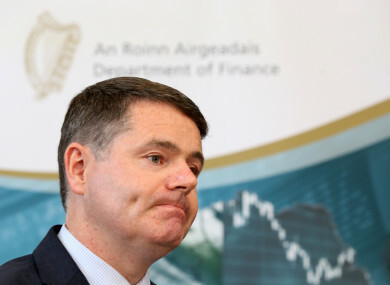 “My guiding principle is in the public’s interest and that was the case when I had to make decisions in relation to how we invested in transport and tourism when I was Minister for Public Expenditure and that will continue to be the case,” Donohoe told reporters in July. It’s understood the shares, (which can be seen here in the Standards in Public Office Commission (Sipo) Member’s Declarations), were granted to the minister’s wife during her employment with Diageo – a company she no longer works for. A spokesperson for the minister confirmed to TheJournal.ie that Donohoe has never worked for the drinks industry, confirming that a portion of the shares were jointly held in the minister’s and his wife’s name. “The process of putting all shares back into the minister’s wife’s name is now underway. This process will have no impact on any decision taken by the minister on Budget Day,” they added. Email “Paschal Donohoe begins transfer of Diageo shares into wife’s name ahead of Budget”. Feedback on “Paschal Donohoe begins transfer of Diageo shares into wife’s name ahead of Budget”.